Description: The smallest of the trumpet family is the piccolo trumpet, pitched one octave higher than the standard B♭ trumpet. Most piccolo trumpets are built to play B♭ pitch, using a separate lead pipe for each key. The tubing in the B♭ piccolo trumpet is one-half the length of that in a standard B♭ trumpet. Piccolo trumpets in G, F, and even high C are also manufactured, but are rarer. The piccolo trumpet should not be confused with the pocket trumpet, which plays in the same pitch as the regular B♭trumpet. 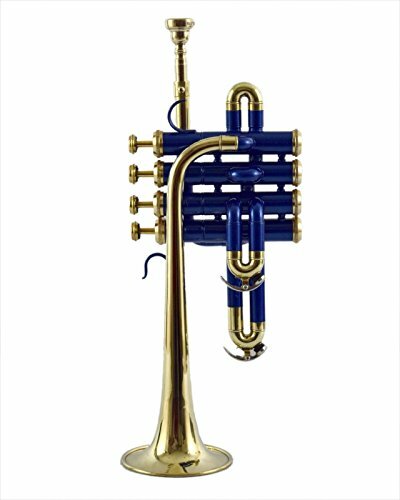 Product Description : Beautifully designed and in perfect finish piccolo trumpet is available for sale, all the keys are working in perfect condition ,checked by professionals. This stylish piccolo trumpet can be used by both professionals and beginners. Is available for sale at a great discount we manage best quality in low prices.